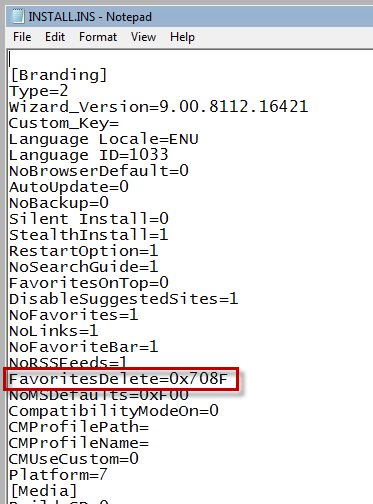 IE 9 Reset Deletes Favorites? Sure this was the cause, I deleted that line, opened IE, imported a few links, ran the Reset in IE again, closed, opened, and saw this time the IE Favorites were not deleted. Some quick research shows that the custom.ins file is deployed when the Internet Explorer Admin Kit is used to customize settings when IE is installed. This entry was posted on December 13, 2012 at 2:53 pm	and is filed under Troubleshooting. Tagged: Internet Explorer, Process Monitor. You can follow any responses to this entry through the RSS 2.0 feed. You can leave a response, or trackback from your own site.